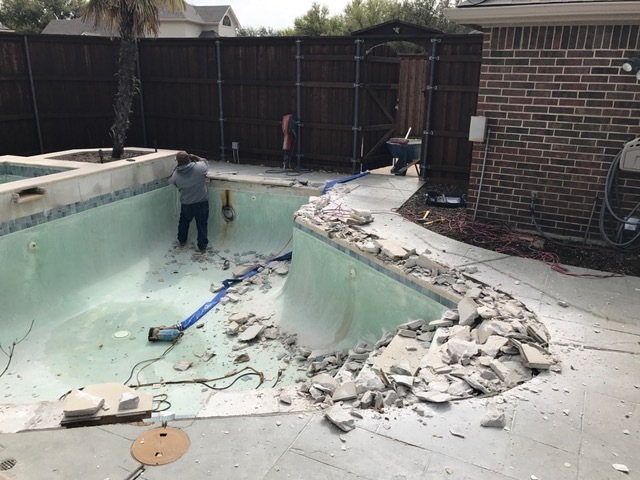 After a year and half of saying we were going to remodel this 1995 pool we inherited with our new house we have finally signed with a contractor and are so looking forward to getting it finished. So many decisions to be made! We are replacing the coping, waterline tile, plaster, and veneers with ledger stone. We are a bit undecided on the plaster finish; either Stonescapes Tropics Blue or Midnight blue. 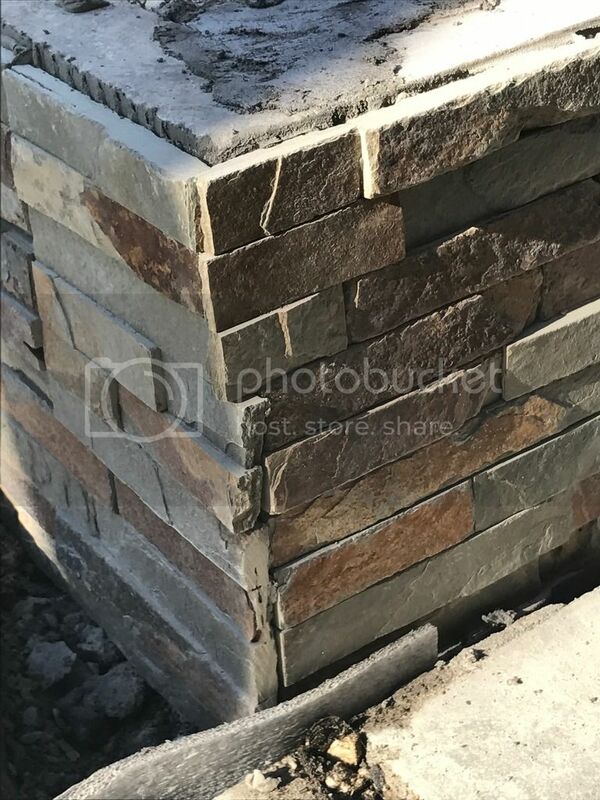 The thought is to go dark as the decking is a darker grey, the coping will be Pennsylvania flag or silver mist flagstone, and the ledger stone is slate to match. The pool is only 3.5.-4 feet deep through the entire thing, so we are unsure if the tropics blue will look really blue or not, but don’t want it to be black either. 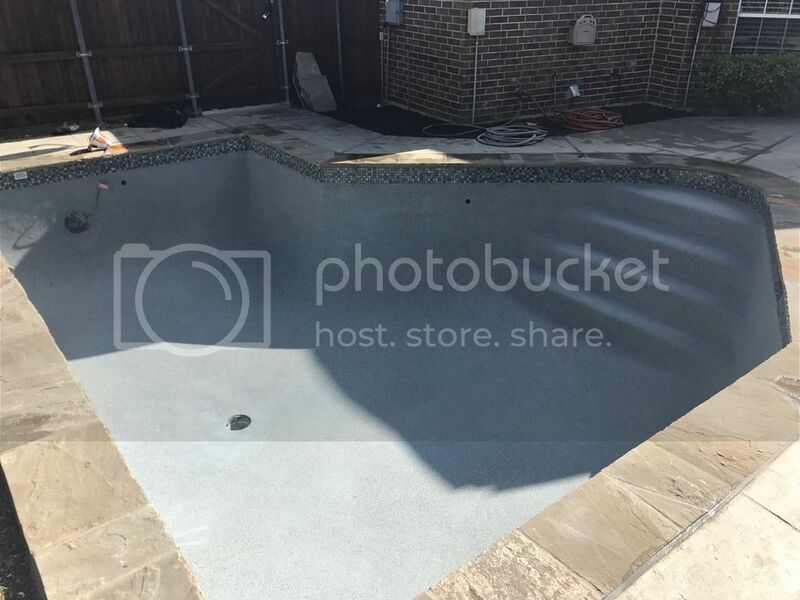 Would love to see some pictures of shallow pools with those finishes, its hard to tell from all the online photos how deep the pool is. Can't wait to share some pictures of the progress; we should be getting started in the next week or so. BUT I like it how it is now!! LOL It is very pretty! I do like the colors you picked. I would suggest the Penn flag stone. From what I know, its usually less likely to flake off over time. Trust me, you dont want that. Neat pool too. I know a couple that wants a very small pool just like this one, and I am going to show them this. Welcome to TFP by the way. Hope you enjoy it. Yes, your PB needs to be careful in choosing the flagstone. Some flakes and some doesn't. Non-flaking is better. I have some of both. 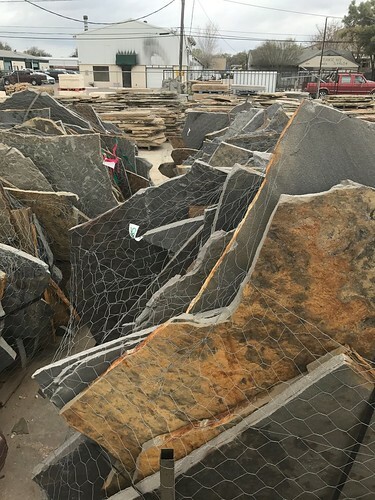 PA flagstone (aka Bluestone) is almost guaranteed to be fine. There could be a flake or two from any given piece if the surface is natural cleft, but it has nothing to do with salt. Most all will remain perfect. Thanks everyone! So I guess the consensus is that the bluestone is more durable than the silver mist, really good to know. I am going to be picking out the stone with the PB soon. 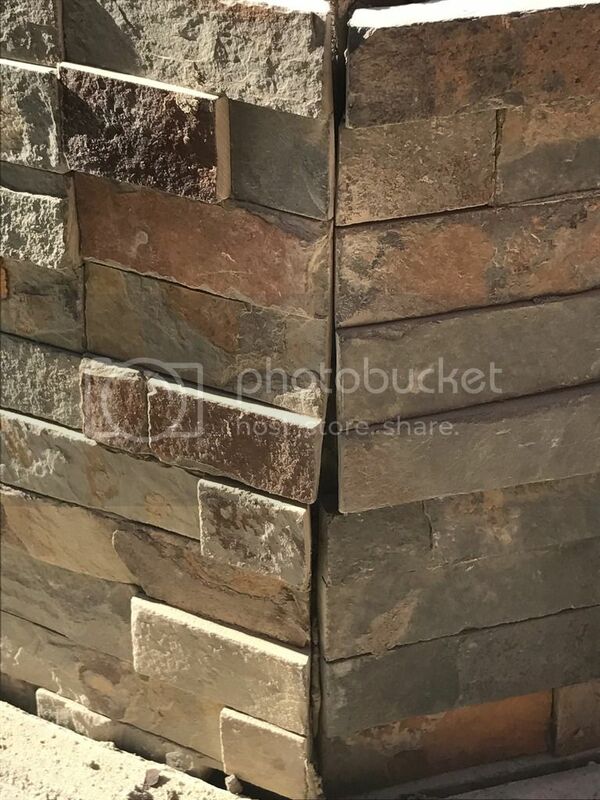 How about the stacked stone/ledger stone? It is a slate stone, will this flake as well and should I make sure its sealed? The pool is chlorine, not salt. Yea, its really dense, and "compacted" if you'll allow that description. Some of mine seems like flaky layers biscuits. As for the ledger stone, someone will have to answer, but I dont think it suffers the same problems. For my flagstone it is pretty obvious which is which just by looking. I have 3 kinds of flagstone around my pool. Some that is dense and there is no sign of layers or ability to flake off any pieces. Then there is some that has some very thin layers, like paper thin. And then there are some that are more like biscuits that you can separate layers with just your finger nail, maybe 1/16"-1/8" thick layers. I will say that all of the flagstone has pretty much settled down now and seem pretty stable. Even the worst ones. And all of it still works fine and will last as long as I want it to. There is more discussion in my pool thread, link in sig. And don't let anyone convince you that saltwater causes the flagstone to do this. Patrick doesn't have SWG and my worst pieces of flagstone are on paths away from the pool. 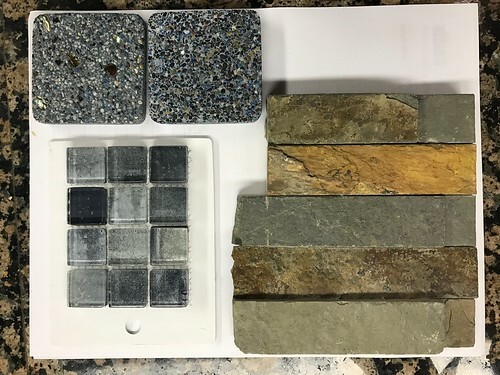 It is just natural stone doing what natural stone does. So today we started demo and broke out most of the tile and coping. The pool light has been troubling me since we bought the place, you could wipe of the stain but it would come back real quick and I put this on the list to be sure is addressed prior to the new surface. 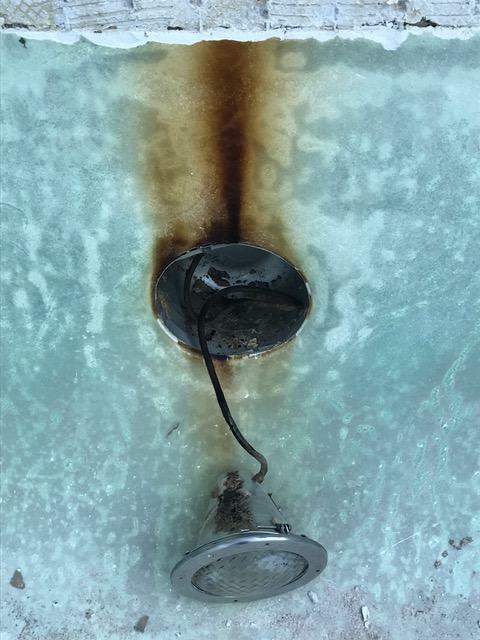 It almost looks like the wire is burnt or overheated, could a burnt wire cause the rusting stains in the pool? -- Pool light has worked the entire time. 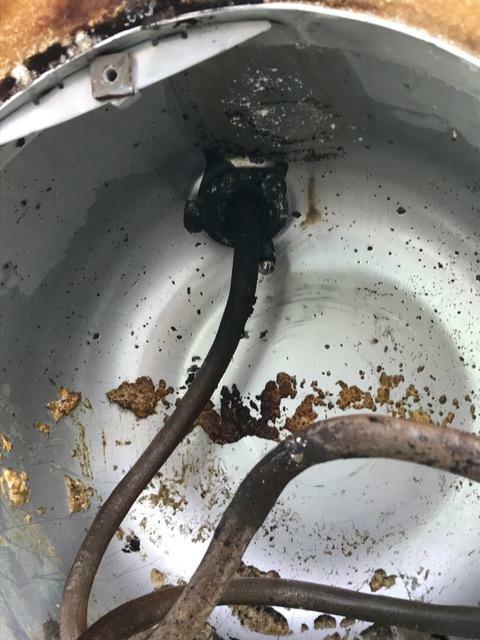 Has anyone seen a light look like this? Would it be best to just replace the whole unit? If it were me I would not even think about taking the chance of messing up all of your hard work. I would replace everything I could NOW. I am not sure why the light would stain UP like that. Kind of scary to think about. Time for new everything! I bet your whole body was sore after all of that work! WOW! Nice job! Certainly a few updates since the last post. 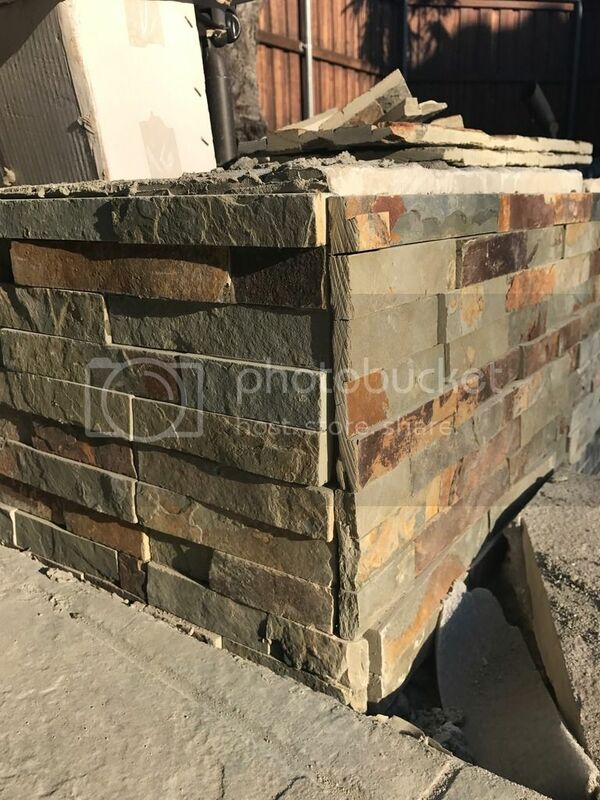 I am pretty concerned with the ledger stone installation it just doesn't look right to me. First I don't think they waterproofed the behind it which I had specifically asked for with going with a darker tile, I wanted to ensure moisture wouldn't seep through it. It also looks like the corners were just cut and not used correctly as I figured they would overlap one another and they make corner sections of the ledger stone. 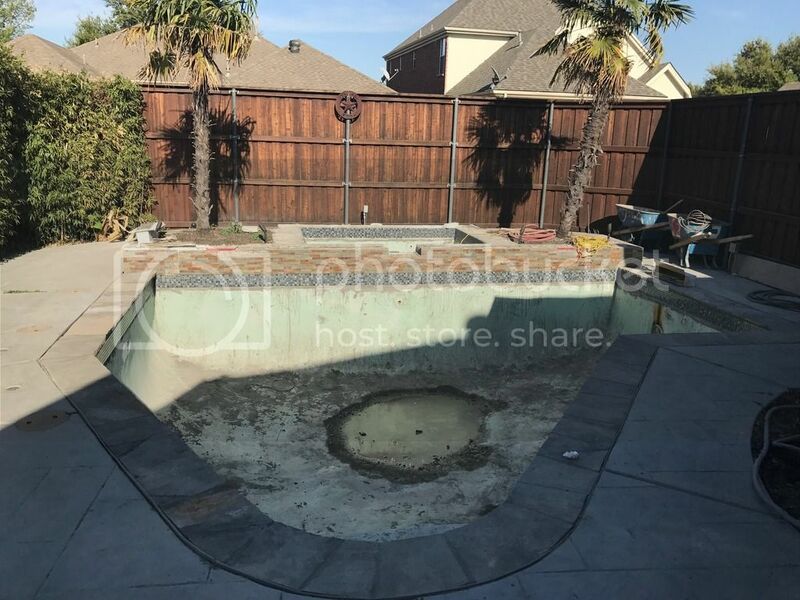 Secondly this pool has a lot of 45 angles, and this looks terrible, shouldn't this look much more closer or overlapping to prevent the crack line? Would you find this acceptable? I am meeting with the PB tomorrow to discuss. I think a redo on the redo is in order. The third picture isn't so bad. But someone needs to have a little pride in their work! One word-nope! Do over time. 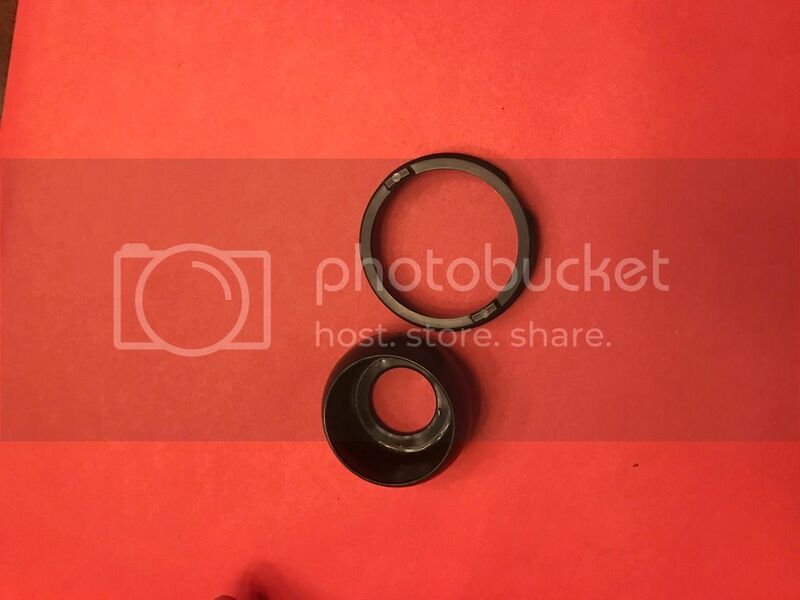 Does anyone know what kind of return fittings these are? They looked very odd to me and I couldn't find anything similar online. They have a very thin collar and it looks like the eye just sits in there. Got the plaster in today! Here is a link for your pretty new plaster! Note the 30 days no swimming depends on what start up is done. Ask your plaster person what they say. 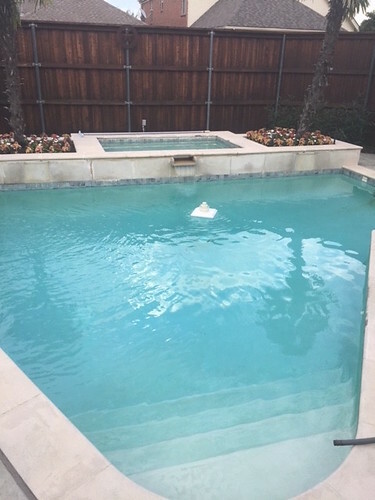 For the return I suggest asking Swimming Pool Supplies - Pool Parts - INYOPools.com They have just about everything for pools and should know. Take some measurements so you can give them all of the info. Tell them TFP sent you! 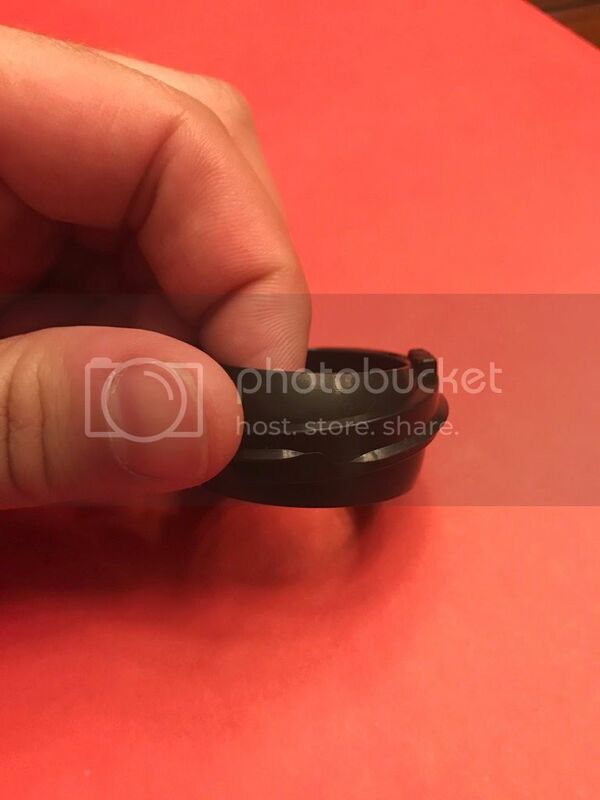 Intelliflo VS bearing replacement - 1) any experience, and 2) any recommendations in DFW?